HAMMER OF THE GODS Viking metal rockers Arm the Valkyrie combine heavy music with cosplay. Conceived over a game of Magic: The Gathering and named for the Viking spirits, the North Bay's newest heavy metal outfit, Arm the Valkyrie, come armed with an array of Norse mythology, Dungeons & Dragons lore, comic-book cues and cosplay culture built into its grindingly ethereal sound. Joseph Johnson, who goes by the name of Spectre; all five members have adopted pseudonyms, like characters in a role-playing game. "We listen to everything we can get our hands and ears on," Johnson says. "And between the combined experience of all the members, there probably isn't a style of metal we haven't played in some past project." For Arm the Valkyrie, the band members decided to pool their resources into a new body of music. 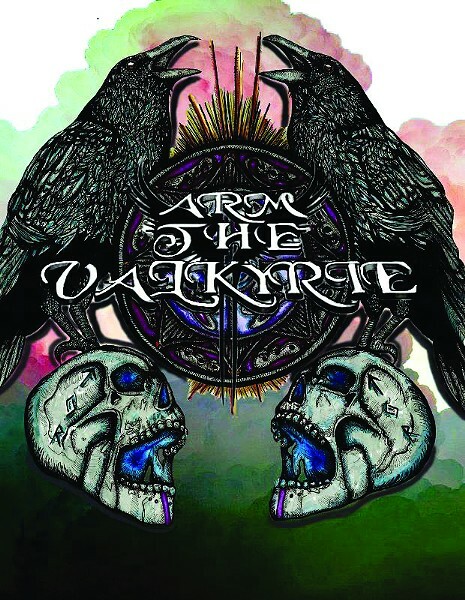 The results can be heard on Arm the Valkyrie's debut three-track EP, Sojourn, which displays a diverse crossover of prominent metal styles blended into a new brand of Viking metal. Each track on the EP builds in speed and scale, lyrically evoking images of frost-covered vistas while haunting atmospheres of sonic otherworldliness permeate through the use of aggressively strummed 12-string bass lines, pummeling percussion and smoldering guitar riffs. Recorded live in one afternoon at Loud & Clear studios in Cotati, Sojourn sounds all the heavier due to Johnson's extreme vocals, which were exasperated by a bout of bronchitis. "It was a wretched experience for sure," he says. "Our bassist, Mordred [Ben Shackelford], thought the effects of the sickness just added to the sound and insisted we keep the take." Originally a four-piece, Arm the Valkyrie recently added guitarist Ed "the Shred" Fullmer, whose other band, Barren Altar ("Play It Black," March 1, 2017), just released their doom-laden debut LP, Entrenched in the Faults of the Earth, to rave reviews in the metal community. Arm the Valkyrie open Barren Altar's album-release concert on June 22 at the Arlene Francis Center. "Every one of us is in the band that we want see play live," Johnson says. "That's the reason why we do this, and as long as you stay true to that ideal, you stop needing any other reason to play music." Arm the Valkyrie storm the North Bay with Barren Altar and others on Friday, June 22, at the Arlene Francis Center, 99 Sixth St., Santa Rosa. 7pm. $13; all ages. armthevalkyrie.bandcamp.com.